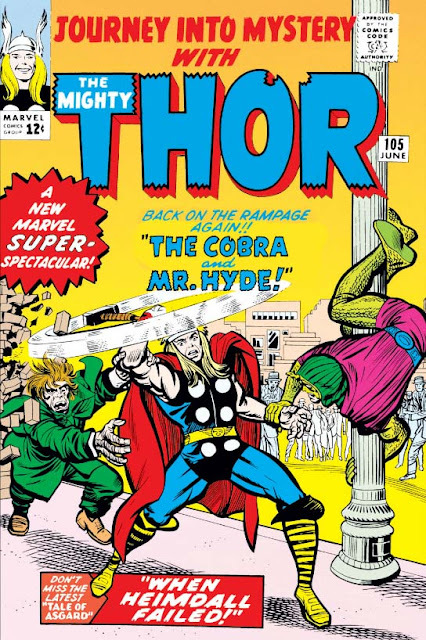 This issue features the return of not one but two Thor villains - the menacing Mister Hyde and the ridiculous Cobra. And, you know, Thor's having had enough villains by this point that they can easily cross paths and lead to a bona fide Super-Villain Team-Up is a sort of marker as to how far this thunder god has come. Granted, it may not be as classic a pairing as that of Dr. Doom and the Sub-Mariner, but it's a start...! After the obligatory misunderstanding and battle that every superpowered meeting seems to lead to (and didn't we just see one of those? ), the Cobra and Mister Hyde decide to join forces to take down the hero who's beaten them both. This is when Hyde shows the Cobra his latest invention - the ludicrously powerful "Time Reversal Ray". When fired at a person, the machine locks onto the target, tracks their movements backwards through time, and displays their tracked events for the wielder to see. The extent to which this could be exploited and misused seems almost limitless, and the only reason they don't discover Thor's secret identity is because as soon as Thor disappears from the scene (to be replaced by Donald Blake), the machine loses its lock. Still, it's such an unbalancingly powerful device that I'd have expected it to disappear after this story; to my surprise, however, it would reappear in one form or another a couple of times down the line. Bizarre concept, yes. But it makes for a neat visual! 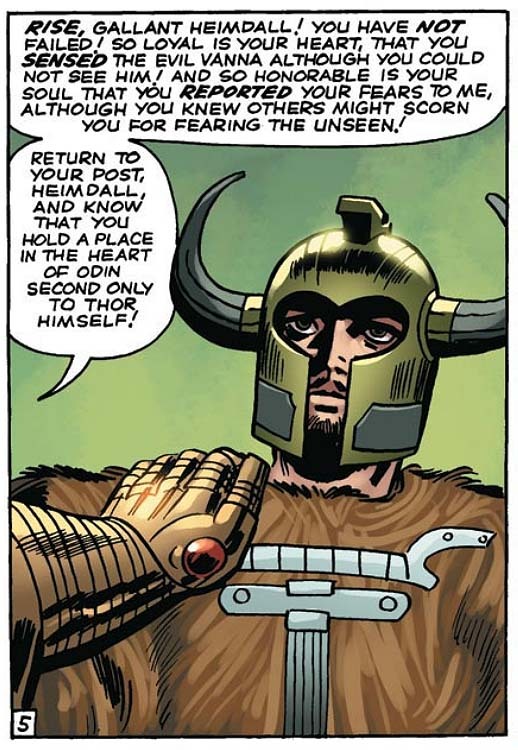 Continuing with the subplot of our hero's frustrated love for Jane Foster, Doctor Donald Blake decides that the only way he can win her heart is by giving up his identity of Thor (since Odin has specifically declared that Jane is unworthy of the love of a god). This is a compelling theme, and told right it would be the main thing we take away from the story. Unfortunately, what most sticks in mind are the couple of dumb loopholes that are used to get around the restrictions Stan has set up for the character. 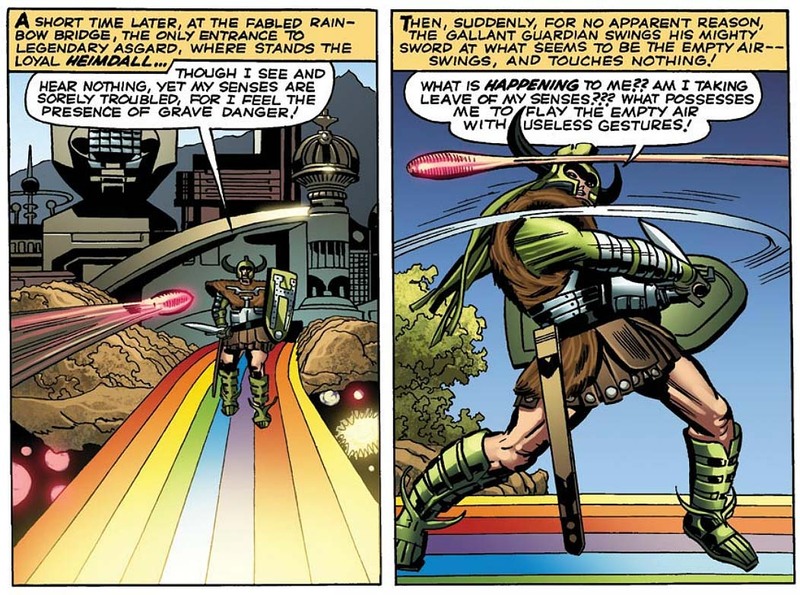 First, a captive Don Blake, separated from the cane that turns him into Thor, is able to trigger the transformation anyway - by getting the villains to tap his cane near him instead. (Okay, so ANYONE can turn him into Thor by tapping his cane? Really?) 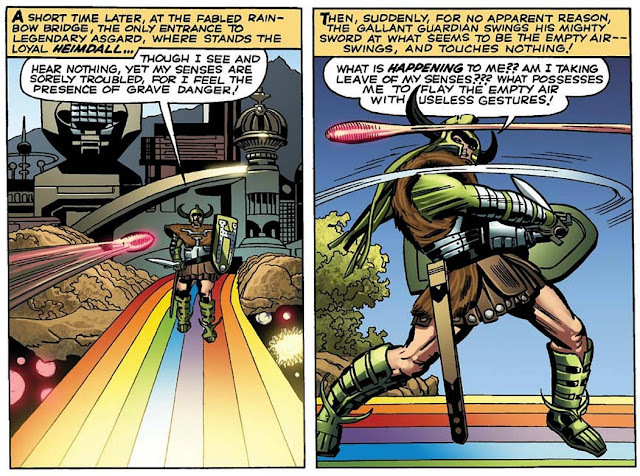 Of course, once Blake has turned into Thor and the cane has turned into his hammer, Thor is helped by the fact that no other mortals can lift or move the weapon, thus preventing anyone from taking it away from him. But not, as we find, anything - as we see when Hyde uses a machine of his own devising to nab Thor's hammer ... with magnets. If you can read these pages without eye-rolls and groans, you've thicker skin than I. The Wasp tests out her new stinger. And yet the real milestone for this issue isn't the guest-star, but the continued evolution of Janet Van Dyne, the Wasp, as Hank Pym unveils his newest creation: a weapon for her which consists of shooting bursts of compressed air. 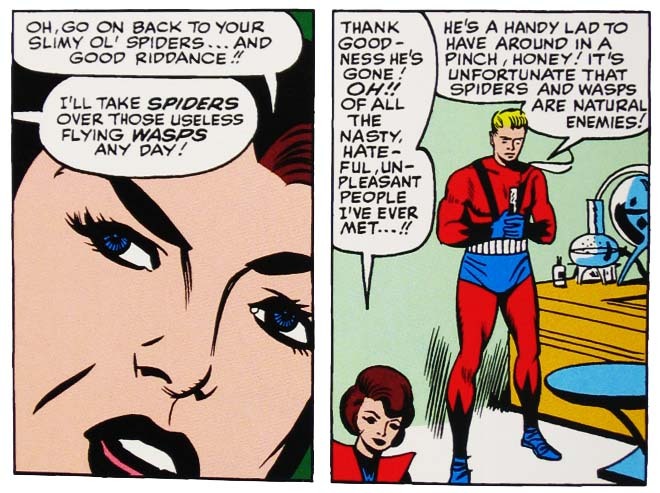 This "Wasp's Sting" isn't quite up to the bio-electric one Pym would later invent, but it's a start. 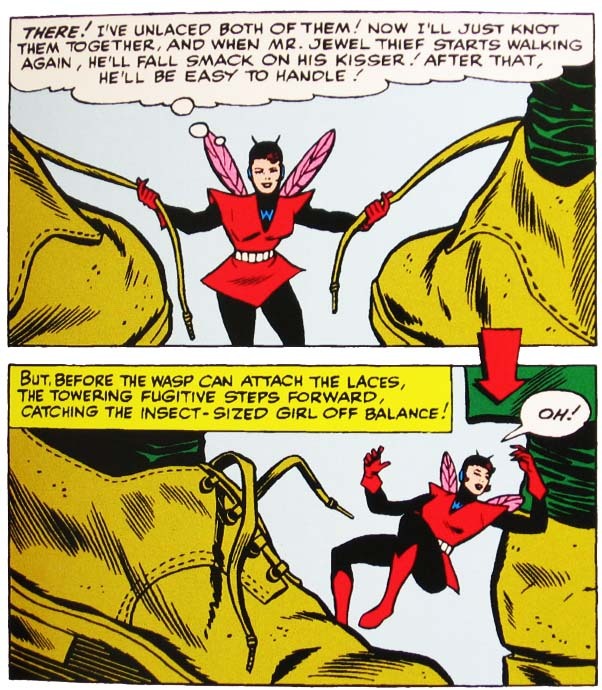 More importantly, when coupled with the relatively recent addition of the Invisible Girl's invisible force fields - which can be shaped and directed offensively as well - this shows a commendable effort on Stan's part to gradually turn the Marvel women from passive spectators into strong, involved players in their own right. You are now listening to Anthill Radio! The plot (such as it is) is serviceable, if uninspired - but then, in a tale featuring both a hero upgrade and a hero guest-star, that's not too surprising. 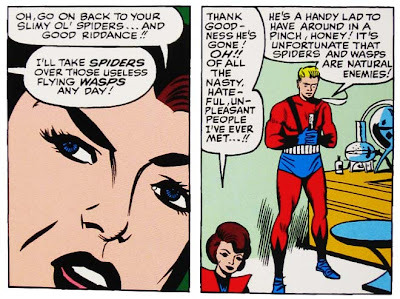 Hank Pym's main bad guy (such as he is), Egghead, returns to cause mischief with his own ability to talk to the ants, convincing them that Spider-Man plans to attack Giant-Man and the Wasp! 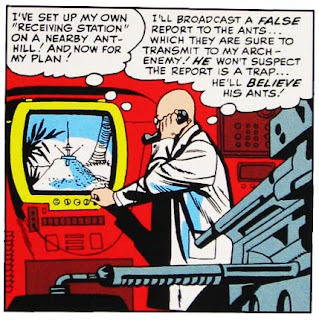 When Pym's antennae-adorned network passes along this message, he and Jan go on the offensive, and the obligatory super-hero battle ensues. I assume this "natural enemies" joke was dropped the next time they met. Or at least - I certainly hope so! The bumbling hero seems a staple of Larry Lieber stories, from what I can tell. Or did that happen only in his Ant-Man tales? 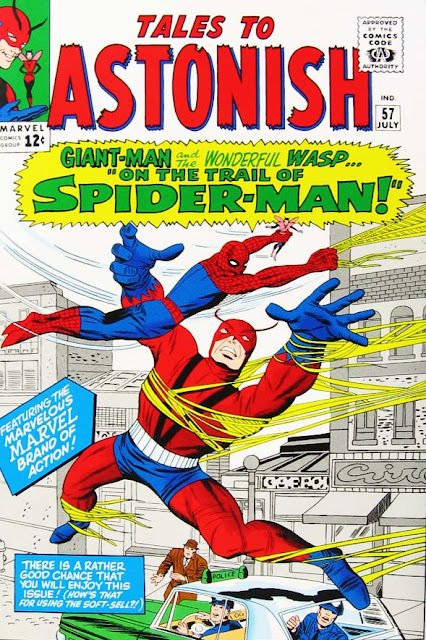 As previously discussed, the first issue of Daredevil was illustrated by Bill Everett - and, due to a variety of issues, took six months to complete. As a result, with issue #2 the art chores were taken over by Joe Orlando, a man who had worked for EC Comics in the 1950s, and would begin drawing for Warren Publishing's Creepy in late 1964, before beginning an editorial stint at DC Comics - where he would remain for the next 30 years. But it's these early EC and Creepy jobs that most concern us, as his illustrations show a scratchiness, and a slight weirdness, that made him the perfect fit for the stories from those particular publishers. 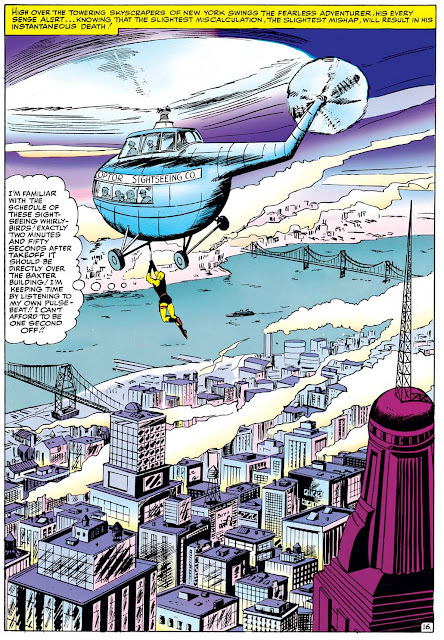 One of the pleasant surprises in Daredevil #1 was the way Everett's art clearly did not attempt to ape Marvel's coalescing "house style", and I'm happy to report that element continues here. of Joe Orlando's art. Check out Electro's creepy eyes! 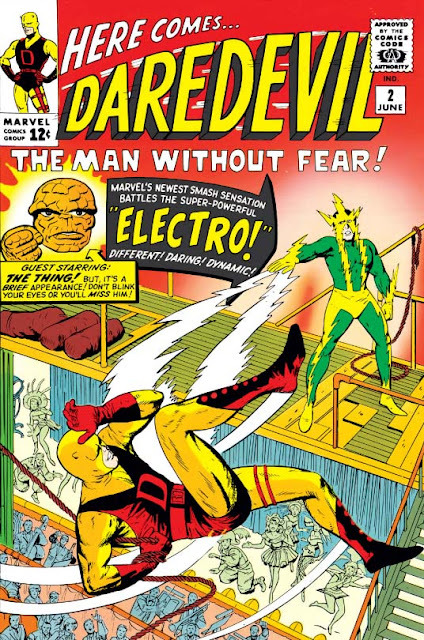 The first issue made sure to give the readers a hero in the same vein as Spider-Man, and this second one continues that tack, featuring as its second villain (and first super-villain) Electro, a relatively recent addition to Spider-Man's rogues gallery. Clearly Stan was hoping to duplicate the kind of gold he struck with Spidey, but he might have hewn a little too closely here. 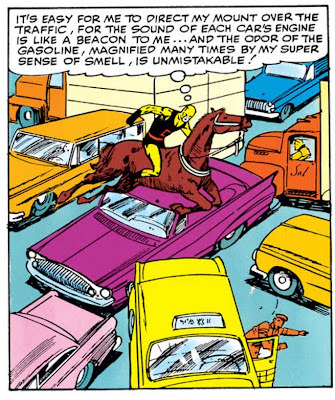 Why, he even repeats the opening kick of "Hero nabs some crooks; thinks how easy crime-fighting has gotten; gets cocky and wishes for a real challenge" that he used in ASM #3! that the door fuses back together? ...Okay then. But that's not all! While the first issue was largely devoid of any of the shared-world elements that Stan had been layering into all these new titles, this story opens with a guest appearance by the Thing, soon joined by the rest of the Fantastic Four as well. They've come to Nelson and Murdock because they're signing a new lease on their Baxter Building headquarters and need a lawyer to look the place over first - and how marvelously inspired is that, to have such a pedestrian motive for bringing them across his path? 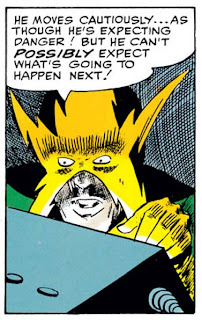 Naturally, when Electro sees the news that the FF is flying to Washington DC for yet another fête, he decides to break into their headquarters to steal their equipment - and his clash with Daredevil is set. 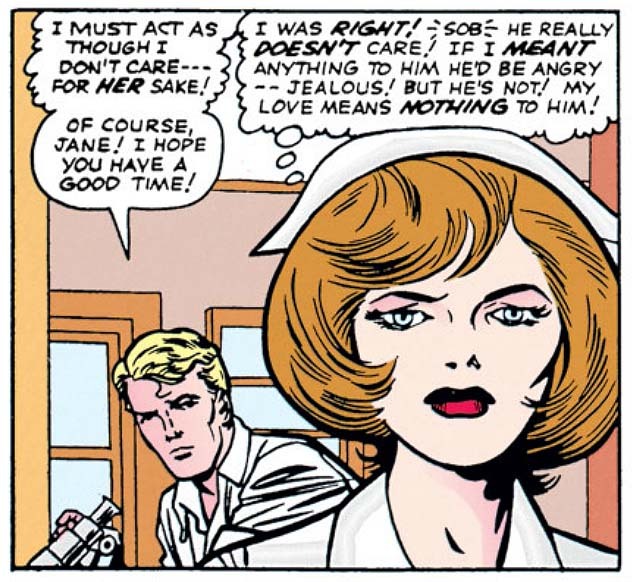 Ever since the blind sculptress Alicia Masters was first introduced to the Fantastic Four, readers have unceasingly asked why someone of Reed's genius could not find a way to cure her. The top-level answer is, of course, that what the infirmity brings to the strip (the poignant theme that Ben Grimm's inner nature is far more important than any outward appearance) is much too compelling to give up; and yet, the readership can be forgiven for wondering how these many high-tech marvels can reside in the same world as such continuing low-tech ailments. So it's notable that Stan endeavors to bring the question to the fore in DD's second outing, rather than trying to evade the topic altogether. The answer as provided is somewhat unsatisfying - Matt turns down even investigating a doctor's cure, worried that regaining his eyesight might remove his super-powers - but it's impressive to see that Stan is already anticipating the kinds of questions readers might have for this new hero. The scene: stunning. The content: ludicrous!